What it is: Discover the secret for a rejuvenated skin with this beautiful cream of high purity and delicacy. A creamy texture that melts into the skin, wrapping it in a mild moisturizing, protective and reparative veil. Its rich composition in regenerative active ingredients such as White Caviar Oil, Organic Amazonia Essence and a Bio-Ceramide Blend, smooths and repairs the skin instantly. What it does: In the heart of this unique cream there is a formulation of anti-aging active ingredients which are highly protective, pure and revolutionary that provides a hydrated skin, prepared to act against the daily aggressions, increasing the resistance against the causes of the skin aging. Beautiful skin begins now. Who it's for: For all skin types: including dry or dehydrated. - : -	Global rejuvenating Treatment. - : -	Protects skin from all type of aggressions and increases the skin’s tolerance levels. - : -	Preserves and enhances a pure hydration. - : -	Helps to restore the damaged barrier function and provides a photo-protective effect. 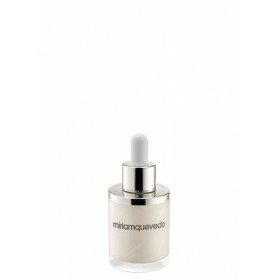 - : -	Helps to contribute to the skin’s regeneration process. - : -	Desensitizing and antioxidant properties. -- : -	Prevents the appearance of redness produced by some kind of agents and helps to diminish the symptoms of irritated skin. - : -	Infuses nourishment to skin. - : -	Calms the skin with an incomparable comfort sensation. - : -	Attenuates neurogenic inflammation and itchiness related to sensitive skin. - : -	Provides the skin with a healthier, softer and radiant appearance. - : -	Acts on the following Aging Theories: Free radicals, Photo-aging, Thermal Aging, Inflammaging and Theory of Wear. Apply The Glacial White Caviar Precious Cream (day and night) on face, neck and neckline, directly after applying The Glacial White Caviar Recovery Serum. Gently massage with finger tips until it is completely absorbed. Use our MIRIAM QUEVEDO massage techniques to reinforce the benefits of Precious Cream. Bio-Ceramide Blend: Composed by cholesterol, phospholipids and glycosphingolipids. Maintains the hydration and the integrity of the cutaneous barrier. Contributes to the regular renewal of keratinocytes, the decrease of which is the principal cause of aging. High Potency Triple-Antioxidant Complex (Tocopheril Croman, DNA protector peptide): Daily prevention. Captures, blocks and defends of three types of free radicals. 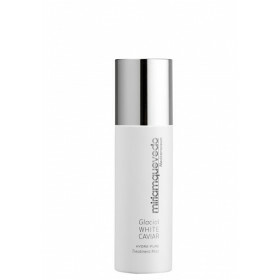 Active bubble that purifies skin cells and protects the cell core from aging. Organic Amazonia Essence: Red resin used since ancient times in medicine for its ability to repair and regenerate. Chamomile Butter: With anti-inflammatory and repairing properties. Calm reactive skin and improve rough skin.